Mention the name Hawkshaw Hawkins to a country music fan, and he or she will probably immediately recognize the name as one of the men killed in the plane crash that took the life of Patsy Cline in March, 1963 (along with Cowboy Copas and Randy Hughes, Patsy's manager and the pilot of the ill fated plane). Patsy has become more famous in death than she was during her brief career, but Cowboy Copas and Hawkshaw Hawkins, who were well-known stars of the Grand Ole Opry have been all but forgotten, which is sad, because their legacy deserves more than that. These tribute pages are my own small attempt to correct that. Hawkshaw was a warm, engaging performer, blessed with a technically perfect singing voice, who starred on three major radio barn dances. His records sold well and his fan club was one of the largest and most active in existence. His music drew on the blues, boogie, tradional country, and above all else, honky-tonk. His rich smooth voice was considered one of the best in country music at the time. The nickname "Hawkshaw" was one acquired in boyhood, which he later used as his stage name. He was a top headliner at the WWVA Jamboree in Wheeling, West Virginia, having joined the cast there in 1946, the same year he got his first record deal with King Records. An avid horseriding fan, he used horses in his western shows, in which he did rope tricks, and stand-up comedy as well as singing. His musical talents allowed him to pull off a wide variety of material, from maudlin weepers to uptempo novelties and ballads. He was with the WWVA Jamboree from 1946 to 1954, and joined the WSM Grand Ole Opry in Nashville in 1955. Entered the army in 1943 and served as an engineer, stationed near Paris, Texas where he and friends would sneak out on Friday and Saturday nights to perform at local clubs. Hawkshaw's first record deal was with King Records, which he signed in 1946. His first recordings for King were After All We Have Meant to Each Other and The Way I Love You, released on July 26, 1946. At the time, King Records artists frequently covered songs originally recorded on other labels. 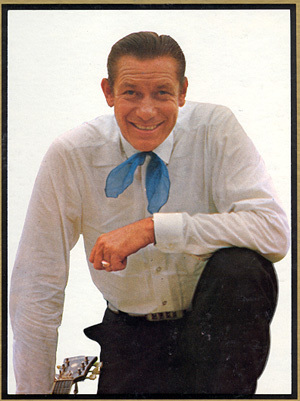 During this period, Hawkins recorded many songs previously recorded by others, including Pan American (Hank Williams), I Love You a Thousand Ways (Lefty Frizzell) and Slow Poke (Pee Wee King). He had a minor hit with the song "The Sunny Side of the Mountain," which would later become his signature song. His first hit single was "Pan American," which climbed into the country top ten. Over the next three years hed had four other Top Ten Singles, "Dog House Boogie," (1948), "I Love You a Thousand Ways," (1951), "I'm Waiting Just for You," (1951), and "Slow Poke," (1951). In May, 1953 Hawkshaw switched from King Records to RCA Victor, which, because of RCA's wider distribution led him even more into the national spotlight (On King, his biggest following was in the Northeastern United States and Eastern Canada). Hawkshaw joined the cast of the Grand Ole Opry in 1955, where he became good friends with Marty Robbins and Don Gibson, and renewed his friendship with his Wheeling neighbors Wilma Lee and Stoney Cooper, when they joined the Opry in 1957. Wilma Cooper is still in the Opry cast today, and her daughter Carol Lee Cooper is on the Opry with the Carol Lee Singers, who do backup vocals for many of the acts. In 1959, Hawkins moved over to Columbia Records (Marty Robbins was on this label). Johnny Horton's The Battle of New Orleans was a big hit that year, and spawned similar songs, including Hawk's first Columbia release, Soldier's Joy, which, while not as popular as Horton's song, did reach number fifteen on the country charts and number eighty seven on the pop charts. In September, 1962, Hawkshaw returned to his first recording label, King Records. In a three day period he recorded what would be his last twelve songs, including his big hit, Lonesome 7-7203. Justin Tubb (son of Ernest Tubb), the writer of this song (he also wrote Patsy's Imagine That) originally pitched the song to Hawk's second wife, Jean Shepard, who recorded it for her label, Capital Records. Capital however has never released it to this day. Hawshaw really liked the song, and had a feeling it would be a bit hit for him. He inscribed a copy to Ralph Emery with "Play the hell out of this, hoss." It first appeared in the Billboard country chart in the March 2, 1963 issue (three days before his death). Lonesome 7-7203 was absent from the charts for the two weeks following his death, but re-appeared on March 23rd and went on to spend 25 weeks on the chart, four of them at the number one spot, something that eluded him during his lifetime. It remains my own very favorite Hawkshaw Hawkins song to this day. Hawk's recorded legacy was treated haphazardly in the three decades after his death, but in 1991, Bear Family Records released a comprehensive, multi-disc overview of his RCA and Columbia records, called "Hawk." CLICK HERE TO ORDER HAWKSHAW HAWKINS MUSIC FROM CDNOW.COM! CLICK HERE FOR HAWKSHAW HAWKINS PICTURES.